Construction Equipment Rental Market size is set to exceed USD 140 billion by 2024; according to a new research report by Global Market Insights, Inc.
Increasing residential & commercial construction projects globally are anticipated to drive the construction equipment rental market. Improving standards of living and increasing disposable income of people across the emerging economies have led to increased investments in malls & amusement parks, generating demand for the rental industry. Rising reconstruction activities in the U.S. followed by the aging infrastructures are propelling the need to replace it with sturdy structures is propelling the growth of around 3.5% CAGR in the U.S. construction equipment rental market growth. The demand for modernized structures has paved way for smart buildings & smart cities, compelling various regional governments to heavily invest in the infrastructure development. Large construction projects by various regional governments, such as Al Maktoum Airport in Dubai, South-to-North Water Transfer Project in China, Crossrail Project in the UK, and Rashtriya Rajmarg Zila Sanjoyokta Pariyojna in India, are expected to contribute to the construction equipment rental market growth. Owning heavy construction equipment leads to increased maintenance and ownership expenses. Businesses that have budgetary constraints prefer renting equipment since it helps them to reduce the overall project expenditure. In addition, renting equipment saves the hassle of transporting machinery to project sites. It also provides the flexibility of renting customized equipment for the suitable construction projects under consideration. Renting equipment cushions the company from unpredictable financial downturns in the industry. To reduce the overall project expenses, renting is considered as a profitable approach, contributing to the construction equipment rental market growth. Global financial crisis and economic fluctuations are the key factors hampering the construction equipment rental market growth. Lack of skilled workforce to operate the machines coupled with the fluctuations in fuel price is expected to have a negative impact on the industry. Rental companies incur increased maintenance costs owing to the aging rental fleets, limiting the industry demand. The earthmoving & road building equipment segment dominated the construction equipment rental market with a revenue share of over 65% in 2017 is continue grow due to the increasing large-scale construction projects globally. Rapid urbanization has led to the growth in the demand for such equipment in commercial and residential construction activities. Earthmoving equipment such as backhoes, loaders, and excavators find applications for residential and commercial construction works. Excavators are gaining popularity due to the increasing use of such equipment in the surface level and below-ground operations, surging their demand for construction & mining activities. 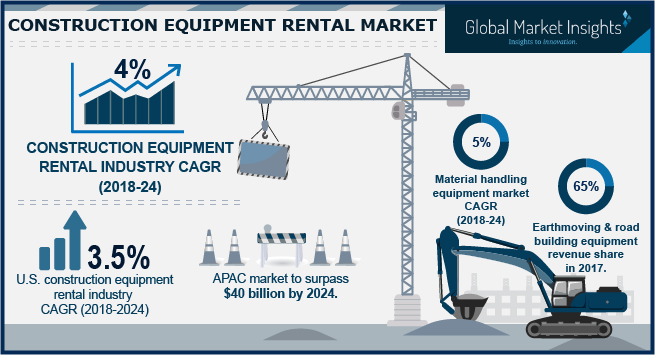 Europe construction equipment rental market is expected to grow at a CAGR of over 4.5% owing to the shifting trend among European construction companies to rent rather than purchasing equipment. Several countries in Europe including Russia, Spain, and Italy are recovering from the economic crisis, following which the construction sector is gaining stability across these regions. Countries including France and Spain are showing a steady growth due to the increasing number of construction projects in the region. The degree of penetration of rental companies is comparatively less in Germany owing to companies in the region still preferring to own machinery than renting. However, the presence of major companies, such as Loxam, trying to expand their market presence in Europe is expected to boost the construction equipment rental market growth. The construction equipment rental market is highly competitive with the presence of key players such as Cramo PLC, Ashtead Group, Blueline Rental LLC, Nesco Rentals, Riwal, Herc Holdings, Caterpillar, Inc., Shanghai Hongxin Equipment Engineering Co., Ltd., Ahern Rentals, Inc., Loxam Group, and United Rentals. Companies are trying to incorporate the latest advanced technologies such as GPS, RFID, and telematics, into their construction equipment to offer enhanced rental solutions. Furthermore, rental operators are stressing on providing sophisticated on field and online certified training courses for the safety of operators.